SYS4NET Review 2019: Is SYS4NET a Good Hosting? SYS4NET offers Spanish web hosting with a 99.9% uptime guarantee and SSD storage. Higher-tier storage allocations are generous for the price, but the entry-level packages are on the pricier end of the spectrum. SYS4NET is a Spain-based company that was founded in 2005. It offers Windows and Linux based shared hosting, VPS cloud services, and dedicated hosting from its servers in Murcia, Spain. 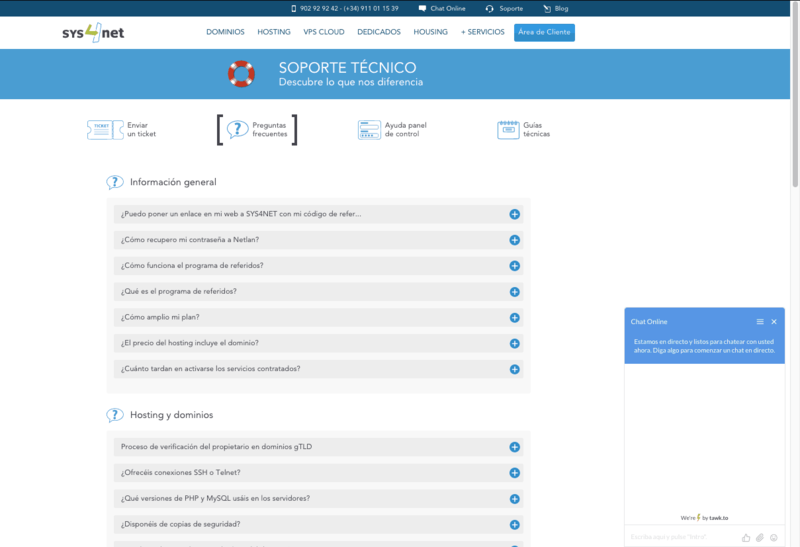 SYS4NET’s services and support are available in Spanish. All SYS4NET shared hosting plans come with a 99.9% uptime guarantee, a DirectAdmin control panel, and unlimited traffic. There are also more than 130 one-click integrations via Installation including WordPress, Magento, Joomla, and Drupal. Unfortunately, you’ll need to purchase an SSL certificate separately as SYS4NET doesn’t provide them for free with shared hosting. There’s also no mention of website backups. All in all, SYS4NET’s WordPress plans look like an excellent offering compared to its shared hosting plans, especially considering you’ll be hosted on a high-availability and easily scalable cloud infrastructure. Advanced webmasters can take advantage of additional cloud VPS plans. These come fully-managed by default, although you also have the option of self-managed servers. SYS4NET markets itself as a Spanish web hosting service. One of its standout features is the ability to have a Spanish IP address for up to ten different domains and an unlimited number of subdomains on its shared hosting packages. The entry-level shared hosting plans for both Linux and Windows-based servers are on the pricier end of the spectrum, given that you only get 1GB of SSD storage for two hosted domains. Surprisingly, despite the unlimited SSD storage and ten MySQL databases, the price of the Unlimited plan is competitive with high-end plans from other web hosts. This pricing differentiates SYS4NET nicely from much of the competition. You get a 30-day money back guarantee on all shared, reseller, WordPress, and cloud VPS packages as well. WordPress webmasters can choose from three available plans. All of them come with free SSL certificates, and the feature lists as you move through the tiers are more or less identical. The real difference between them is disk space, which ranges from 2GB to 6GB. Sadly, there is no plan here that offers unlimited disk space. The price point is a bit high, but webmasters with high-traffic blogs that require less storage space will benefit from SSD, so there is a tradeoff there. Support options are offered in Spanish and are good. Ticket support is offered 24/7, and emails are usually answered within 48 hours. There’s also a live chat option available that I was able to connect with even during the weekend, along with a telephone support option that’s available from 6AM to 10PM daily (Spain timezone). A large self-help section also exists with answers to the most commonly asked technical questions. SYS4NET offers Spanish IP web hosting with a 99.9% uptime guarantee, SSD storage, 130+ one-click integrations, and WordPress-specific plans with a free SSL certificate. The price points for higher-tier shared hosting plans are excellent for the amount of storage, but the WordPress plans are far better value with a superior feature set. Wondering how SYS4NET stacks up against other Web Hosting companies? Enter any other Web Hosting company and we will give you a side-by-side comparison.